LOME (Reuters) - World leaders condemned Togo's army on Sunday for suspending the West African nation's constitution and installing a new president following the death of Gnassingbe Eyadema, Africa's longest serving ruler. U.N. Secretary-General Kofi Annan (news - web sites) said he hoped Togo would ensure a peaceful transfer of power in line with the constitution and African Union leaders branded the appointment of Eyadema's 39-year-old son by the army a "military coup." The current head of the Economic Community of West African States, Niger's President Tandja Mamadou, said on Sunday "no argument could justify this seizure of power by force" and urged Togo to re-establish constitutional order. While Togo's constitution says the head of the national assembly should assume provisional power and elections be held within 60 days, army chiefs instead sealed the country's borders and invested Faure Gnassingbe on Saturday evening. As word of his death filtered out, residents in the capital Lome hurried home and some expatriate workers checked into hotels, fearing trouble. But calm returned after the army said it was filling an obvious "power vacuum." State television broadcast pictures of Gnassingbe, a civilian who was given the influential post of minister of mines in 2003, shaking hands with the army top brass, which has been filled over the years by members of Eyadema's northern clan. On Sunday morning, taxis were circulating normally and residents headed to church. State media played religious music and broadcasts by foreign station Radio France Internationale resumed after an unexplained silence overnight. "Nothing has changed. The struggle continues," said exiled opposition leader Gilchrist Olympio, the son of Togo's first president who was killed in a 1963 coup led by Eyadema -- then a 27-year-old army sergeant. Eyadema died on Saturday while seeking emergency medical treatment abroad for an unknown illness. Four years after the 1963 coup Eyadema seized power in his own name, brooking little opposition during a 38-year rule of the former French colony. Born in 1935, he is a former wrestling champion who loved to sport dark suits and rarely removed his sunglasses. He became know as the archetypal African "Big Man" and earned a reputation for helping mediate in West Africa's many wars. Eyadema was a close friend of French President Jacques Chirac. Togo's former colonial ruler has hundreds of soldiers permanently based in the coastal capital Lome. 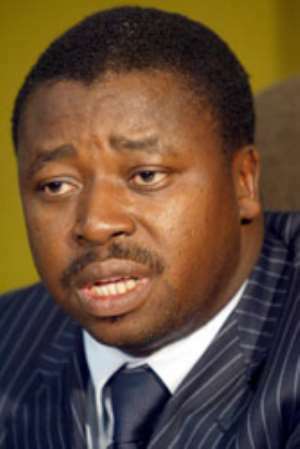 The human rights group Amnesty International accused Eyadema's forces of killing hundreds of people during a 1998 presidential election, in which Eyadema was declared winner after the vote count was abruptly stopped. The sudden change at the top comes as Togo tries to thaw relations with the European Union (news - web sites), which froze aid in 1993 because of what it called "democratic deficiencies." Under an April 2004 deal to win back support from Brussels, Eyadema agreed to implement a number of constitutional reforms and dissolve parliament in the first half of 2005 ahead of a new round of legislative elections.